Castor oil processing from castor oil plant seeds is done in a manner similar to that for most other oil seeds. The ripe seeds are allowed to dry before being split open to discharge the seeds. These seeds are cleaned, cooked and dried prior to extraction. Cooking is done to coagulate protein (necessary to permit efficient extraction), and to free the oil for efficient pressing. 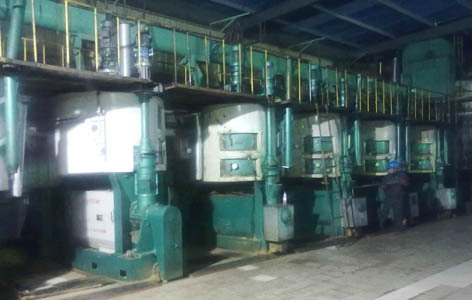 Prepressing is the first step in the castor seed oil processing. Using a high pressure continuous screw oil press called the oil expeller. Extracted oil is filtered, and the material removed from the oil is fed back into the stream along with fresh material. Material finally discharged from the press, called cake, contains to 10 percent oil. It is crushed into a coarse meal, and subjected to solvent extraction with hexane or heptane. Once the oil has been extracted from the seed, it is necessary to remove impurities from the oil. The oil is essentially a pure triglyceride, and contains almost 90% glyceryl tricinoleate. It is the ricinoleic triglyceride that is needed in order to produce high quality castor oil. In order to process quality castor oil from castor seeds, two main stages occur in the castor oil plant. Castor oil ranks high in importance among the vegetable oils that used industrially.Although the forage does not approach that of soybean oil and some other oils that areused principally for food, annual production of castor oil amounts to impressive figuresnevertheless. In 1948, when production was of the highest rate ever attained, theestimated quantity of castor seed produced through out the world was 515000 tons,enough to yield more than 400 million pounds of castor oil. Castor seed is grown commercially on plantations but also harvested from wild plants. The seed must be hulled after harvesting. This can be done laboriously by hand or, more commonly, by machine. Small-scale hand-operated dehullers are available. Contact us anytime whenever you feel interest in castor seed oil processing, we are always at your service!